I hope everyone had a wonderful Thanksgiving holiday. We spent ours with some kind and generous neighbors this year. There was a ton of food and all of it was delicious. My plate was quite full. I also was able to get my Christmas tree up and decorated while my husband decorated outside. 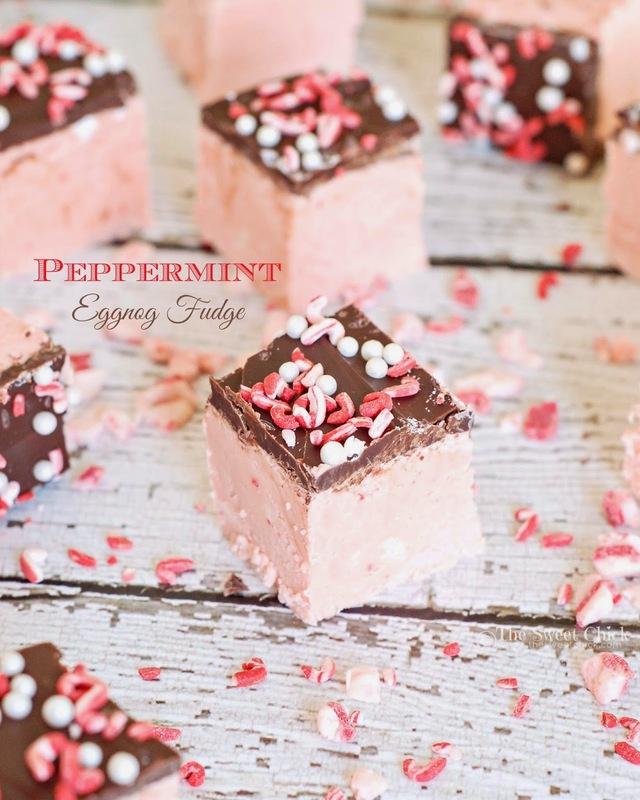 To get myself in the full Christmas spirit, I whipped up a batch of this Peppermint Eggnog Fudge. There's nothing better than combining two of the most popular holiday flavors for a creamy, smooth fudge that fills your mouth with delightful mintiness. These Andes Peppermint Crunch baking chips are the best. I just eat them straight out of the bag. They are great to bake with because they melt so smoothly. The fudge comes together pretty quickly. It just requires a little stove top work. Nothing to be scared of. You can just add sprinkles and leave the fudge as is or you can add another layer of goodness with some melted chocolate. Now doesn't that look good. I even added some peppermint flavored candy cane sprinkles to finish it off. Chocolate and peppermint go together so well. The fudge came out with a perfect peppermint flavor with a hint of eggnog. The eggnog made it smooth and creamy while keeping the peppermint from becoming overpowering. My candy cane loving kids, husband, and neighbors loved it. 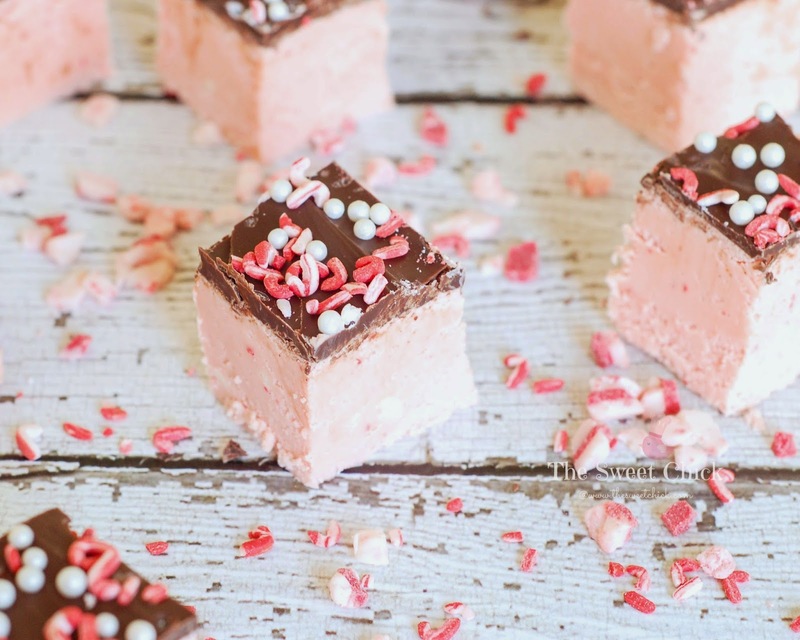 However, this Peppermint Eggnog Fudge is better than candy canes because it melts in your mouth without sticking to your teeth. Line a 8 or 9 inch square pan with aluminum foil and spray foil with a non-stick spray (I used Baker's Joy). 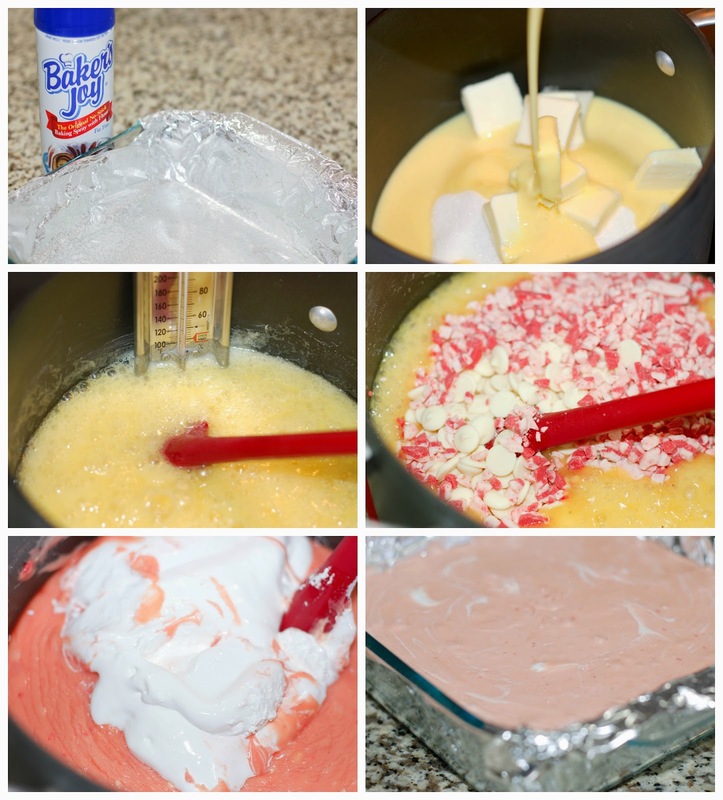 In a medium saucepan mix together the sugar, butter, eggnog and salt. Bring to a rolling boil, stirring constantly. Continue boiling 8 to 10 minutes over medium heat or until a candy thermometer reaches 230°F. Don't forget to stir constantly to prevent scorching. Once the temperature has been reached, remove from stove-top. 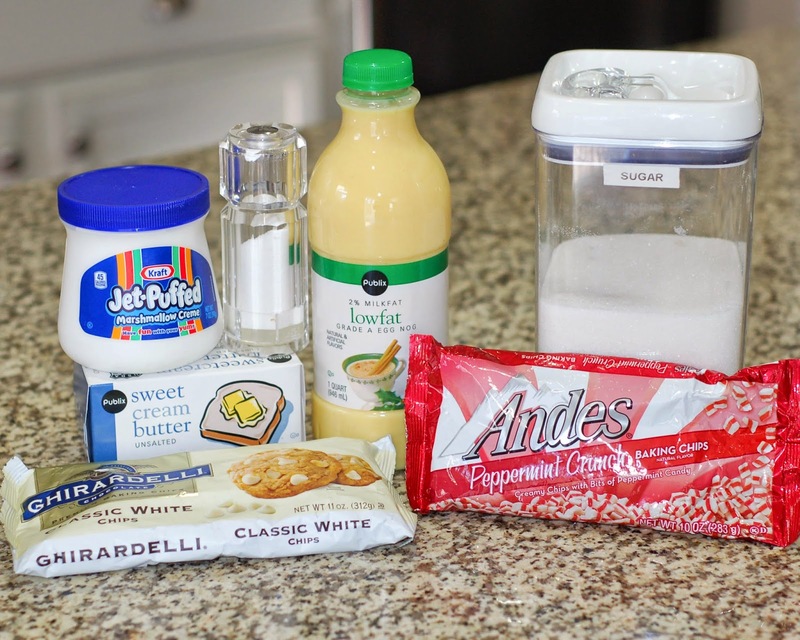 Quickly add in white chocolate and peppermint baking chips. Stir until chocolate and baking chips are melted and smooth. Then stir in marshmallow creme. Beat until well blended and then pour into prepared pan. You can use a spatula to smooth out the top if it doesn't spread evenly. Place fudge in the fridge for about 15- 20 minutes to cool and set completely. 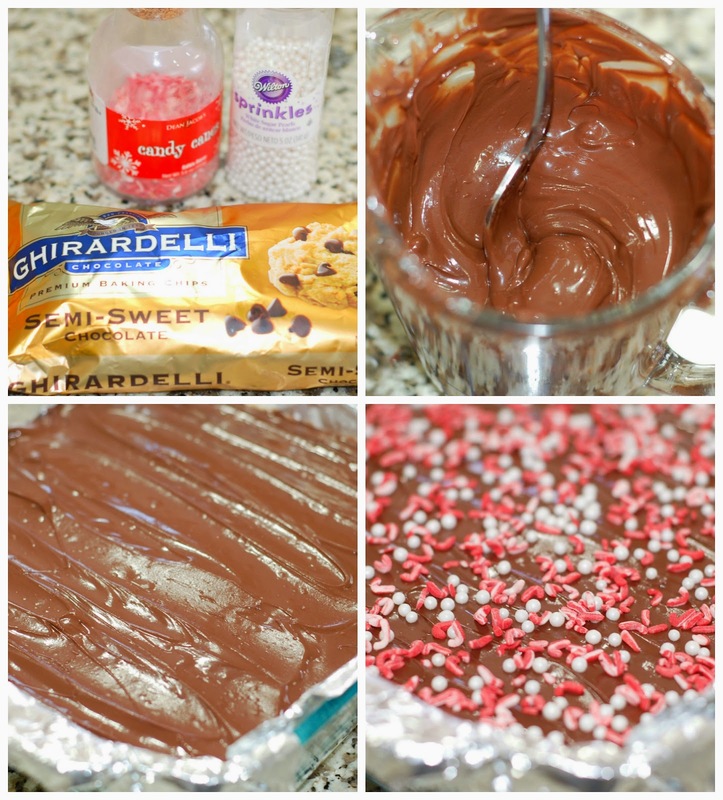 Pour the melted chocolate over the fudge and spread evenly with a spatula. Add sprinkles to the top. Place fudge back in the fridge for chocolate to set. Once chocolate sets, cut fudge into squares with a sharp knife. Grab some hot cocoa with your fudge square and enjoy! I melt my chocolate chips in a glass measuring cup in the microwave. Therefore, it's easier to pour over the fudge. I kept my fudge in an airtight container in the fridge, but I also placed some squares in the freezer for a week and it came out tasting just the same. Perfect for making ahead for Christmas gift packages. What a perfect fudge! I should make them! This looks delicious! Perfect for the holiday season. We would love for you to share with everyone at Party i Your PJs. Kim, sorry I didn't make it last week. I just entered it now. 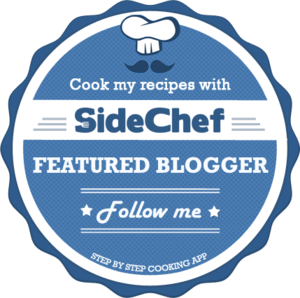 Could you translate your recipes in Spanish, please?